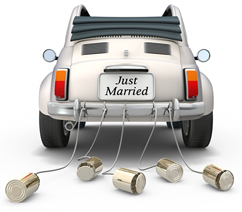 Do Car Insurance Rates Go Down When You Get Married? So your wedding went a little over budget, huh? The honeymoon spared no expenses either. And what's this you hear about a "marriage penalty" on your income taxes? There's no doubt that tying the knot can be one of life's more expensive rites of passage, but the good news is that you should be able to save some money on your car insurance. It's the morning after your Big Day. You wake up for the first time as a married man or woman, and you don't really feel all that different. But in the eyes of auto insurance companies, you're an entirely new and better person. Since insurance companies calculate premiums based on lots of hard data and facts, you would think that they would realize that you're the same driver you were the day before. But all of that data tells them that married people are much safer risks - they drive more responsibly, they get fewer tickets, and they're much less likely to file claims. As a result, married people pay lower premiums than their single counterparts for the same coverage, all other things being equal. Although your insurance agent probably didn't send you an official wedding gift, you might feel inspired to write her a thank you note after seeing the savings on your next bill. If you and your spouse each have auto insurance through different companies, consider combining your policies under one agency. In fact, now would be a great time to shop around for the best insurance deals you can find. Comparison shopping for auto insurance has been known to save people lots of money while maintaining their current coverage, so shop around for the insurance that best fits your needs. You should be able to get a multi-policy discount, and save even more if you're able to find a company that also handles homeowner's or renter's insurance. If you're planning on starting a family, perhaps now would be a good time to look into life insurance, for which you may qualify for discount car insurance. If you're shopping around for a new home or an apartment to share with your new spouse, ask your insurance agent which neighborhoods qualify for the lowest car insurance rates - where you live and drive affects not only your homeowner's or renter's insurance, but also your auto rates. If you're looking at a pair of apartments and you're unable to decide which to choose, the one that qualifies for the lower insurance rates might be the better option. First and foremost, be a good driver. If your new spouse has a lead foot, convince him or her to slow down - it could save you money. Secondly, always review your insurance needs at least once a year. Don't be a captive customer of your insurance agent- shop around. Insurance is a financial product, and you should regard it as such. Always be sure you're getting the best coverage for the least amount of money possible.